When it comes to determining how to fix your aging plastic or metal plumbing pipes, you may be torn between choosing to traditionally re-pipe your plumbing system or rehabilitating your pipes with an epoxy pipe liner. 1. What is the difference between epoxy pipe lining and repiping in Chicago? There are many differences between epoxy pipe lining vs repiping in the greater Chicago area. When you choose to line your plumbing pipes with epoxy, you are choosing to seal and prevent leaks without ripping out the drywall or finishes in your business or residential property or jackhammering through concrete foundations, sidewalks and parking lots. This service helps restore your pipes to like-new condition without the drama or cost involved in hiring additional contractors to perform repair work. Epoxy pipe liners can last upwards of 80 years. When you choose to repipe part of all of your plumbing system, you are choosing to install new plumbing pipes. This process involves tearing into your walls to remove all of your old plumbing pipes and then replacing them with brand new copper, PVC, PEX or CPVC pipes. Once the pipes have been properly installed, you can expect to receive the maximum useful life out of those pipes, which ranges from 40 to more than 70 years. 2. Why would I want to perform a repiping? You would want to repipe your multi-unit residential building or commercial or industrial building if your plumbing pipes are severely deteriorated or collapsed and the sidewalls are not thick enough to support the epoxy pipe lining process. You would also want to fully replace galvanized steel pipes and Orangeburg pipes because these types of piping systems are no longer used and well beyond their expected useful lives. 3. Why would I want to choose to line my pipes with epoxy? If your deteriorated plumbing pipes are located under concrete slabs, behind masonry walls or drywall or located in your ceilings and floors, you may want to choose to line your pipes with epoxy rather than fully replacing them. This is because the process of installing brand new pipes can result in damage to your existing finishes, and the pipe replacement process can take longer than lining your pipes. By contrast, epoxy pipe lining can be completed in a few days, and some jobs can be completed in a single day. Once your pipes are lined and the lining has cured, water service is immediately restored, and you do not need to hire additional contractors to perform repair work on the finishes of your building. 4. Can NuFlow help me choose between epoxy pipe lining vs repiping? Our pipe lining technicians in Chicago can help you objectively choose between epoxy pipe lining vs repiping. 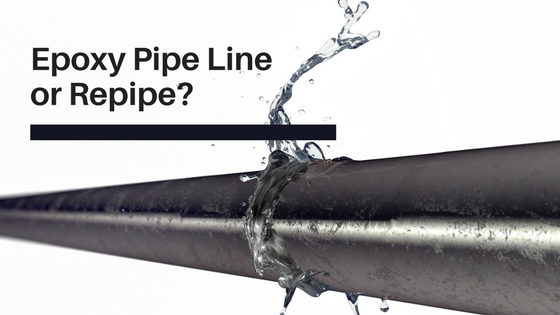 This is because, unlike most pipe lining and plumbing businesses, we want to help you choose the best solution for your multi-unit residential building, commercial building or industrial building, even if it means not choosing to line your pipes with epoxy. In fact, we can help you choose a custom solution when it comes to rehabilitating your plumbing pipes because we partner with the experienced, licensed plumbers of Althoff Industries. Having a close working relationship with professional, traditional plumbers means that we can choose a solution that replaces your worst pipes and lines your other pipes, which saves you money, time and hassle. For more information on our epoxy pipe liners or to schedule a pipe assessment for your building, call us at 815-790-9000. We serve Chicago and the greater Chicago area, including Crystal Lake, Barrington Hills, Huntley, Elgin and Arlington Heights. I live in a 350 unit townhouse community with a interconenctive common water pipe system (we pay one water bill for the whole community). our pipe have occasional leaks, would the apply coating system work with our underground pipes? The HOA is considering this versus underground pipe replacement. Very informative article. Good to have more knowledge about the difference so customers can make better decisions.